The AND, OR, NAND, and NOT gates each compute the respective function of the inputs, and emit the result on the output. By default, any inputs that are left unconnected are ignored — that's if the input truly has nothing attached to it, not even a wire. In this way, you can insert a 5-input gate but only attach two inputs, and it will work as a 2-input gate; this relieves you from having to worry about configuring the number of inputs every time you create a gate. (If all inputs are unconnected, the output is the error value X.) Some users, though, prefer that Logisim insist that all inputs be connected, since this is what corresponds to real-world gates. You can enable this behavior by going to the Project > Options… menu item, selecting the Simulation tab, and selecting Error for undefined inputs for Gate Output When Undefined. In short, these components work as expected as long as all inputs are either 0 or 1. If an input is neither 0 nor 1 (it is floating or it is the error value) then the component treats it as both 0 and 1: If the output would be the same both ways (as when an AND gate has one input that is definitely 0 and a questionable second input), that will be the output value; but if the output changes depending on whether it is 0 or 1, the output is the error value. The multi-bit versions of each gate will perform its one-bit transformation bitwise on its inputs. The inputs into the component. There will be as many of these as specified in the Number of Inputs attribute. Note that if you are using shaped gates, the west side of OR and NOR gates will be curved. Nonetheless, the input pins are in a line. Logisim will draw short stubs illustrating this; and if you overshoot a stub, it will silently assume that you did not mean to overshoot it. In "printer view", these stubs will not be drawn unless they are connected to wires. 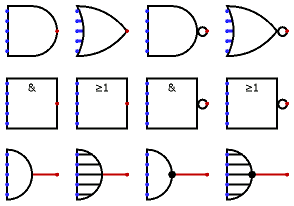 The gate's output, whose value is computed based on the current inputs as described above. When the component is selected or being added, the digits '0' through '9' alter its Number of Inputs attribute, Alt-0 through Alt-9 alter its Data Bits attribute, and the arrow keys alter its Facing attribute. The direction of the component (its output relative to its inputs). Determines whether to draw a wider or narrower version of the component. This does not affect the number of inputs, which is specified by the Number of Inputs attribute. However, if shaped gates are selected, then the gate will be drawn with wings to accommodate additional inputs beyond what the shape naturally accommodates. Determines how many pins to have for the component on its west side. If yes , the input is negated before it is fed into the gate. The inputs are counted top-down if the facing is east or west, and they are counted left-to-right if the facing is north or south.